Chapter 1: (07:45) The Blues Turnaround The turnaround is one of the most essential elements in blues music. A turnaround is a brief section (typically two measures in the blues genre) that harmonically leads back to the beginning of the form. In most 12 bar blues tunes, the turnaround occurs in bars 11-12. The static rhythm of the basic shuffle pattern is contrasted by the rhythm of the turnaround as well. This rhythmic contrast also pushes the harmony back to the first bar of the 12 bar blues form. At 1:00, Hawkeye provides an example of how the turnaround lick works in the context of a 12 bar blues in E. He plays the shuffle pattern throughout the bulk of the form. When bar 11 hits, he does not continue the shuffle pattern with the tonic E chord. Rather, he substitutes the turnaround to create a more effective transition to the beginning of the form. Note: Tablature and notation to this demonstration can be found under the "Supplemental Content" tab. Turnarounds can serve as very effective introductions to blues songs. In addition, a lead guitarist can apply a series of turnarounds over the entire 12 bar form to produce an effective blues solo. Hawkeye will demonstrate this valuable concept in future blues lessons. By now, most of you are probably familiar with the "open" D7 chord shape. By removing the open string note (D) from this chord, a movable shape is created. If you slide this basic shape up two frets, a rootless voicing of and E7 chord is formed. This is the tonic chord of a 12 bar blues in the key of E. This is the first chord used in the turnaround. Then, this chord shape descends chromatically in half steps down to a tonic "open" E chord. Since turnarounds are used so often in blues music, it is important to amass a large catalog of turnaround licks to draw from. By simply varying the rhythm of a single turnaround lick, new turnaround options are created. For example, the chords in this turnaround can be strummed in quarter notes. They can also be strummed in a triplet rhythm as indicated in the "Supplemental Content" section. These chords can be arpeggiated in a variety of different rhythms as well. Listen carefully at 03:50 to the remaining variations that Hawkeye demonstrates. Remember at all times that blues harmony is rather simple and repetitious. Varying the way in which you play basic blues elements such as the shuffle and turnaround will give your blues playing a sense of spontaneity and excitement. So good Mr. Hawkeye, so good! You are a joy to learn from. You obviously love what you do and this is the clearest explanation of this genre I have come across. Just brilliant in your explanation, lovin' your enthusiasm, you are a natural teacher. Great motivator you are Hawkeye. Why do you call the E7 a chord in the turnaround when it does not contain an E note. I guess the same is also for the D7 when the 4th string (base note D is not struck). Hawk eye, love the lessons & can't wait to see what's next . You are very easy to follow & a joy to watch! Nice job Hawkeye many years since I started to play the Blues just a refresher ,we don't hear much of this stuff these days Cheers. I sent a video of me playing "Good Morning Blues" from my iPhone to my four adult kids. My first performance! Got great feedback but apparently I make some pretty weird faces when i play! Have to work on that. Cant wait to keep progressing. Thank you so very, very much. I watched the Super Bowl while practicing. I was better! Hawkeye, great lesson. From a theory standpoint, why does the turnaround include notes that are not in the key of E? Thanks so much for enjoying these lessons and for your question, Chris. One can play any note(s) as 'passing notes' in any key ... notes that are not necessarily in the key of the song ... as long as one does not 'hang' or stay on those non-key-scale notes ... just touching on those notes in passing to the notes of the scale one is in/any note can be played as a passing note in between the notes of the scale/key. All notes that are played that are not in the key, passing notes, can be used as a 'bridge' between the notes of the scale. Don't over-think the theory aspect ... just follow my instructions and enjoy the process ... the intellect/'theory' aspect will start to fit in/be understandable the more experience you gain as you work your way through these lessons. Don't ever let music theory stop you from playing the instrument ;-) and enjoying the results. I hope you continue to enjoy these lessons. Thanks so much, Laura. There are free lessons at my web site: http://hawkeyeherman.com/guitar-lessons.htm ... articles on blues history and the many iconic blues performers I met and learned from directly here: http://hawkeyeherman.com/articles.htm ... and I have posted many blues songs on video at youtube .... http://www.youtube.com/user/HawkeyeH ... please watch these videos to see how I use the skills I teach in my lessons when I'm performing in concert and at festivals ... try to play along with me, try to 'steal' my licks/riffs/ideas ;-) I hope you continue to enjoy these lessons. Thanks again for your kind comments. lost of fun, thanks for the lesson! You're most welcome, Leonard. Thanks for your message and kind words about these lessons. Much appreciated. I think it's obvious that I love what I do, and I hope my enthusiasm and the information I've shared with you continues to serve you for the rest of your life. I've been playing and teaching the guitar for over 50 years, and I've given a lot of thought and planning as to the order and content of these lessons. Please be sure to follow these lessons patiently in the order they are presented, progressing from one lesson to the next at your own speed, only moving on to the next lesson when you can accomplish what is in the current lesson. I have posted at youtube .... http://www.youtube.com/user/HawkeyeH ... please watch these videos to see how I use the skills I teach in my lessons when I'm performing in concert and at festivals ... try to play along with me, try to 'steal' my licks/riffs/ideas ;-) In terms of the 'process' and how to go about progressing on the guitar, here's a wonderful/useful quote from the great jazz guitar player Howard Roberts: "The tempo to execute something on the guitar is the speed at which you can do it perfectly, even if that tempo is one notch above a dead stop. That way, instead of trying to do something, you ARE doing something." As you gain accuracy, you can increase that tempo, until you get to the 'final'/'goal' tempo of the material/song/scale/riff/lick. Again, thanks so much for your message and for enjoying these lessons. Hawkeye, I'm having a bit of difficulty playing the B7 at the 7th fret as I have a bit of arthritis in the left hand which restricts the movement of my pinkie. I can't effectively get the left hand pinkie to the 11th fret on the A string. I can manage to get it to the 9th and 10th fret on the B string and then slur it down from the 10th fret to the 9th on a down stroke. Same thing for the A7 at the 5th fret. Does this make any huge difference? It still sounds bluesy to me. I'll keep it short, TOTALLY AWESOME! I love it, the funny thing is the guy who taught me bass many moons ago was teaching me mostly blues rifts based on scales and I remember the bass turnarounds he taught me, it's so cool to see the pieces fit together. I love mixing up the rhythm and like you said so long as you keep time, you can do whatever you want and change it up for each iteration to keep it interesting and keep them guessing. Guess that wasn't so short now was it. Thanks Hawkeye, I loving this course. Thanks for the message and for enjoying these lessons, Kevin. I'm glad the pieces of information are starting to fit together for you. Please be sure to follow these lessons in the order they are presented, patiently progressing from one lesson to the next at your own speed ... and you'll gain a string foundation and understanding of blues music that will allow you to play/improvise blues guitar as you wish. Also, please watch some of my music videos, here: http://www.youtube.com/user/HawkeyeH ... so that you can see how I use the technique I teach here at JamPlay.com when I'm performing in concert and at festivals ... try to play along with me ... and try to 'steal' my riffs/licks/ideas. I hope you continue to enjoy these lessons. Thanks again for you kind message. Thanks...for the clarity. The pieces floating around my head are starting to come together. Because of where I live, I've never been able to find a teacher so I'm self-taught. I've got skills...I can play Miss. John Hurt tunes quite well, but I've struggled with the blues theory...the unifying theme of it. Even the turnarounds confused me until I saw this lesson. Now I've been looking at a collection at E turnarounds I have and I see them all for what they are...an idea, instead of a bunch of turnarounds. Really, truly, thank you. Thanks for the message an kind words about my lessons, BOb. Much appreciated. I've given a lot of thought and planning as to the order and content of each of my lessons. If you follow my lessons in the order they are presented, progressing from one lesson to the next at your own speed and in your own time, you will gain a strong foundation and understanding of blue music that should clarify and make meaningful/understandable many of the 'loose pieces' of blues music information that you may have 'floating around in your head' ... follow my lessons in the order they are presented, progress at your own speed, don't rush, be patient with yourself and thorough in your development of the skills/techniques I share with you in these lessons and the 'loose pieces' will start to 'fit together' in your brain and on the guitar ... and serve your guitar playing for the rest of your life. I hope you continue to enjoy these lessons. Clear, limpid, and (rather) easy to put in practice...and over all very enjoyable.. great lesson !! thanks i am enjoying your lessons so far up to 6 watching them several times over. easy to understand, naturally will take time to play smoothly but very helpful for a slow learner like me. Thanks for the message, Ryan, I am glad you are enjoying these lessons. There is no rush in learning, take your time, learning/playing the guitar is a life work and passion and there is no reason to rush; Thanks again for the kind message. Thanks so much for your kind comments, Luc. Very much appreciated. I will be in France in October to perform and teach, in Versailles, Lyon, Toulouse, and possibly Bordeaux, some information here: http://www.franceblues.com/?p=1637 ... perhaps I'll see you in France in a few months??? ;-) ... that would be cool ... also, please watch some of my many music videos so that you can see how I use the techniques I teach here at JamPlay.com when I'm performing in concert and at festivals ... try to play along with me ... and use my ideas/licks/riffs ... http://www.franceblues.com/?p=1637 ... I hope you continue to enjoy these lessons. Thank you Hawkeye! Your lessons are incredible , entertaining and you are a great teacher, i am so much more into blues now thnx to you! You're most welcome. It's my pleasure to share my passion for blues music with others. THat's why I'm always smiling as I teach. I love the music and I love sharing that passion with others. The great blues songwriter Willie Dixon, who wrote famous blues hit songs for Muddy Waters and Howlin' Wolf that have been covered by the Rolling Stones, Led Zep, and so many other rock groups once said ... "Blues is the roots, and everything else is the fruits." ... well, believe it! ;-) Thanks again. I hope you continue to enjoy these lessons. Hawkeye- thanks for the good lessons. Finally put the words in with the rhythm and the turn around. It's been an interesting 3 (slow) steps journey into the 12 bar blues. But after these two weeks, I think I have it. Can't wait to move on to the next lessons. thank you so much , this is it ,now i,m finally playing the blues thanks to you cant wait to see what can be done next to good morning blues . Glad you're enjoying these lessons. Follow the lessons in the order they are presented, patiently progressing at your own speed. Try not to 'cherry pick'/skip around ... and you'll gain a string understanding and foundation in blues music that will allow you to play freely/create/improvise ... for the rest of your life. I hope you continue to enjoy these lessons. You're most welcome, Ryan. I hope you find that by patiently following my lessons in the order they are presented and progressing at your own speed from one lesson to the next that your understanding of blues music and your playing skills/abilities continue to grow and serve you well. Attention folks! There's a typo in the tabs. In measure 12, the open E on the "and" of beat 1 should be an open A note. Oops!! Thanks for the heads up on the typo, Matt. Much appreciated. Thanks for your hard work and attention to detail. Much appreciated. Thanks for the message and kind words about these lessons, Devin. Very much appreciated. I've given a lot of thought as to the order and content of these lessons. Follow my lessons in the order they are presented and you'll gain a strong understanding and foundation in blues music, and you'll be able to play freely and improvise as you wish. Be patient with yourself, don't move on/progress to the next lesson until you can accomplish what's in the current lesson. Don't rush, this isn't a race, it's a life's work of joy. Watch some of my video at youtube.com to see how I use the techniques I teach here at JamPlay.com when I'm on stage performing in concert and at festivals, and try to play along with me, and try to 'steal my licks/riffs/ideas: http://www.youtube.com/profile?user=HawkeyeH&view=videos ... I met and learned to play blues guitar from some of the most iconic old blues artists, Lightnin' Hopkins, Brownie McGee, Son House (one of Robert Johnson's idols) , Mance Lipscomb, Bukka White (whop taught his cousin, BB King how to play), and many other blues greats. My style of teaching is upbeat and direct and is focused on getting you to play, not on my showing you how much better I am than you. I teach you just as I was taught by the blues greats who went before us taught me... with joy and appreciation for the music and with your interest in accomplishing the ability to play the blues as you feel it my main goal ... to allow you to express yourself through blues music. Check out the free lessons at my web site, as well as the 'original articles' I've written about blues history and the many fine blues performers who took the time to teach me this most gratifying form of music: http://www.hawkeyeherman.com ... I hope you continue to enjoy these lessons. 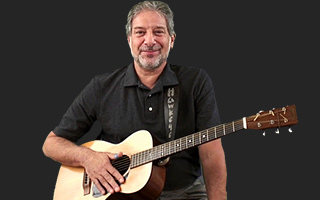 Thanks again for 'traveling' with me on the 'blues highway' here at JamPlay.com. Great lesson! I Had this nailed in about 15 minutes of practice. I think there is an error in the supplemental content of the blues shuffle lesson. In the last measure you have an e note instead of an open a note in the turnaround. Video shows this as an open A note on 5th string. Glad you enjoyed the lesson, and picked up on the idea/skills quickly. Matt does the supplemental content here at JamPlay.com for all of the instructors ... if it's wrong, he'll catch it and correct it. I hope you continue to enjoy these lessons. I like this way of the actual original turnaround.Found out upgrade is 20 bucks so i might swing it in a few days as soon as i got a little bread.I gotta also find a way of Geting my 7 yr old daughter a beginners acoustic guitar and get her on the blues scene.Christas gift and yes she is getting a real guitar. The turnaround is important in blues. Yes, this is true ... that's why it's explained here ... and in other aspects of my blues lesson series. Hawkeye, I'm use a metronome, I'm have trouble with the count on the 12th bar. When I play 1 and 2 and 3 and 4 on the 12 bar, I'm having trouble seeing what lies where. I got this far: at the 1 and, 1=E, and=A. How does 2 and 3 and 4 and lie in the other notes? Thanks for the question, Mark. Much appreciated ... sorry it took me so long to respond ... I've been on tour in Europe since Oct. 31st. Please look at the shuffle with the turnaround in the 'supplemental material' under this lesson. Set your metronome on a slow speed and play what's on the tablature/music. Look at measure #11: beat #1 is a 1/4 note (one full beat), beats #2, #3, and #4, are 1/8th note (triplets), you must stroke the stings three times per beat. The sound of all four beats is #1=dah, #2 =dah-dah-dah, #3 =dah-dah-dah, #4 =dah-dah-dah ... and now measure #12: beat #1 are 1/8th notes that’s are not a triplets, as are beat #2, and beat #3 & #4 is a 1/2 note ... so measure #12 would go: beat #1=dah-dah, #2=dah-dah, beat #3/#4=dah (held for two beats). So, if we just ‘look’ at it as sound rather than mathematics, measrure #11 and #12 would sound like this: #11:dah/dah-dah-dah/dah-dah-dah/dah-dah-dah/#12: dah-dah/dah-dah/dah. You have to be aware of the difference between 1/8th notes that are tied together as triplets (dah-dah-dah), and 1/8 notes that are tied together as two notes (dah-dah). I hope this is helpful and answers your question. Thaks so much for enjoying these lessons. Silly question prhaps but in your turnaround, (first one), how did you know to use the D7 shape? Thanks for the turnaround lesson. That's what was lacking in my blues playing! I love these lessons. Your teaching is awesome!!!!! Thanks so much, tonya. If you stick with the 'program' order of lessons and don't rush, be patient with yourself, and you'll be playing blues guitar and improving your skills ... forever, I hope. Enjoy the process. Thanks again. Thanks so much for the comments and kind words, Michael L. Very much appreciated. I hope you continue to enjoy these lessons and enjoy learning and playing blues music for the rest of your life. You don't NEED a resonator guitar to play blues music ;-) ... but if you want/need an excuse to buy another guitar ... that'll work. I primarily use my 1934 National "Trojan" model guitar (as seen in this lesson) for slide guitar ... I very rarely use my resonator guitar for general blues playing ... some of these lessons here at JamPlay.com are an exception to that 'rule.' I like the sustain of the wood body resonator guitars better than the metal body resonator guitars (I have both styles) ... I find that the wood body is less brash and 'banjo-like' in sound than the metal body versions ... the wood body resonators have a sweeter sound and more sustain ... however, if the choice is up to you. My only recommendation is that you NOT buy a guitar without playing it first ... you should like the sound, it should feel comfortable to play in your hands, and it should be well made ... the least important consideration to me is the appearance ... (for some folks the appearance is EVERYTHING, not for me) ... if you buy a resonator guitar it should make you want to play even more. Just keep in mind that my personal choice is to use a standard acoustic guitar for most of my blues playing ... and I reserve the resonator guitar for playing slide blues almost exclusively. The resonator guitar is certainly 'eye-catching' and does have a compelling sound ... but for me personally, I would not want it to be my only guitar ... nor my first choice guitar. The resonator guitar adds variety and dynamics to my music ... a nice change of pace from the standard acoustic guitar sound that I use most of the time. Again, thanks so much for your kind message and for traveling on the 'blues highway' with me here at JamPlay.com. I hope you continue to enjoy these lessons. That's it Hawkeye - I'm hooked! Used to play classical but this is just awesome. You're a natural teacher that makes it fun and easy to progress - Many thanks! Thanks so much for the kind comments E.F. Much appreciated. Welcome to 'traveling' with me on the 'blues highway' here at JamPlay. I hope you continue to enjoy these lessons. Hi David, Thanks for the message. So glad you're enjoying these lessons and that you're exercising patience ... there's no rush ... take your time and enjoy the process. There are free guitar lessons at my web site: www.HawkeyeHerman.com I hope you continue to enjoy these lessons. Thanks again for the kind comments. Hei. Today, when practicing and putting things together that i have learned so far, i incidentally find my self playing the song "before you accuse me" :-) this is starting to be very ineresting. final, Thanks for the message and for enjoying these lessons. "Before YOu Accuse Me " ... is a Bo Diddley song ... originally ... not a Clapton song originally ... :-) ... and it's 'just another' great blues song ... like thousands of others ... which you should be able to play with very little trouble if you follow these lessons in the order they are presented. Skip around, and you'll still learn a lot ... but follow the order and you'll gain a strong foundation in blues music with few gaps/holes in your understanding of how it all works. Thanks for enjoying these lessons. This is the most fun I have had with a guitar lesson. joehobbs, Thanks so much. There's much more to come ... please stick with the lesson plan as presented and you'll gain a string understanding/foundation in blues music and how to play and create blues music freely on your own. Skip around in these lessons and you'll still learn a lot, but there will be 'holes/gaps' in your 'blues foundation.' Please take your time with each lesson, enjoy the process, don't rush, be patient with yourself, and don't move ahead to the next lesson until you understand and can accomplish what I'm presenting to you in the current lesson you're working on. You're going to be having a lot more 'fun' with your guitar from now on, believe me. Thanks again. Hawkeye, you're the Man! I'm just heading to Lesson 7, thanks my friend. Thanks for enjoying these lessons. I hope you continue to enjoy your rapid progression in learning blues guitar ... especially if you stick to the order of these lessons. I'm giving you a strong foundation in the music so that you can freely create blues musicf on your own ... skip around and you'll still learn a lot, but there will be 'holes/gaps' in your blues foundation. Watch the videos here for good examples of how I use what I teach at jamplay when I'm performing http://www.youtube.com/profile?user=HawkeyeH&view=videos Thanks again for enjoying these lessons. rest assured I'm sticking to the order :) I've just completed lesson 8 and that's it for now. As tempting as it is to look at what's next I want to master playing the basic 12-bar and Blues turnaround in the different keys before going any further. If I can get the hang of that... I'll be VERY pleased. Thank you Hawkeye, I never dreamed you would answer sp Quick. I read the longer post and I realise you are right, to jump ahead would be stupid. So I shall listen to the Master and make it one lesson a ta time, I can't thank you enough, keep going with the lessons. A new Blues Fan! Hi Hawkeye, I never had much time for the Blues, because I never listened to it. However I watched one of your lessons and with the enthusiasm you teach with I was hooked. I can play the Twelve Bar Blues and the Shuffle. However when I try to sing along I lose the count and brake down. Any thoughts on how to overcome this problim. I just love your lessions, and find it hard not to jump ahead off myself. Great teaching. I'm playing for 9 months now and i never had so much fun! Love your lessons and you enthusiasm. I loose count on the turnaround. Too many uneven notes are played. During the shuffle its easy to count, but those chords and triplets mess everything up. :) I play it by ear and it sounds really good. But i think i would not be able to play with other musicians in such way. Force yourself to start playing with a metronome and you'll get that puppy in no time! Is there a typo at the end of the tab ? I guess the open chord is A and not E ? jackie134, Thanks for the comment. Keep at it. Practice. No buzzing/dead strings, just clear tones when making chords. It may not seem like it, but you improve every time you hold the guitar and practice, for a few minutes, or hours ... repetition is where it's at ... that's how we teach our fingers to do what our brain has learned. If you've got the concept clearly in your mind ... it just takes time and repetition to teach your body to respond ... like dancing, painting, woodworking, all physical tasks ... get the steps/positions solidly in your brain, and then teach your fingers/body to respond to the information in mind ... repetition ... and improvement each time you practice. Crawl before you walk, walk before you run, and enjoy the process. Thanks again. ronin808 and mclend1, Thanks so much. There is an endless amount of music that can be played/created by learning the basic turnaround(s) ... and then 'fiddling' with them on your own ... ascending, descending, picking out notes as your so choose, fingerpicking notes as you so choose, etc. Learn the basics ... and then go for being creative. Learning the 'stock' stuff is the beginning ... then twisting and turning things as you feel ... it what blues is about. If you love the blues, play them as you please. Hawkeye, your enthusiasm is infectious, another lesson to work on, maybe it'll also 'turnaround' my playing (with practice) keep up the good work, it's appreciated!